Short-term wilderness tent camping for scouts and selected youth groups. Featuring a 24 by 34 foot meeting hall with benches and tables. A raised hearth fireplace and an old-fashioned potbelly stove supply heating. There is an attached annex for storage or cooking. 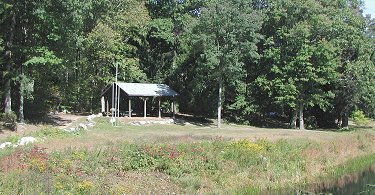 Two 16 by 24 foot pavilions with picnic tables, a barbeque fireplace, two Adirondack Shelters in the tent sites, a parade field with flagpoles and a large campfire ring round out the facilities. Numerous tenting sites accommodating two to six tents are scattered throughout the property. A large glade will accommodate group camping. A two-acre pond with a beach is available for summer actives and fishing is allowed. In the winter the area becomes suitable for ice-skating. Drinking water is available at a hydrant just out side the main cabin and a hand pump is located at the west end of the firebreak. Two pit latrines are located at each end of the camp.